See the DETAILS tab further below for more info about the options. 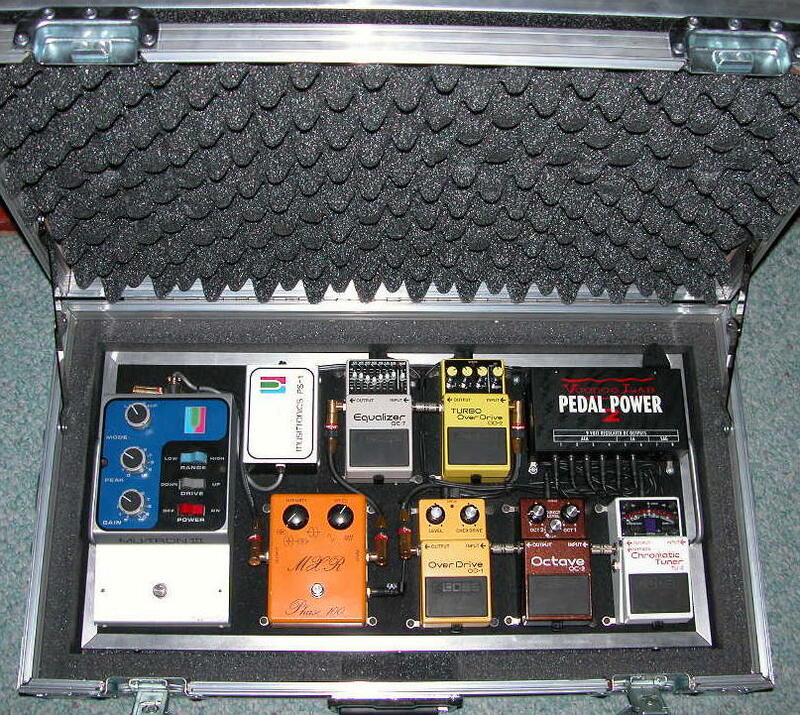 A 32" x 16" pedalboard is shown here for reference only. Please select the length of your pedalboard, from left to right in inches. Length : 48.00" Length : 47.50" Length : 47.00" Length : 46.50" Length : 46.00" Length : 45.50" Length : 45.00" Length : 44.50" Length : 44.00" Length : 43.50" Length : 43.00" Length : 42.50" Length : 42.00" Length : 41.50" Length : 41.00" Length : 40.50"
Please select the width of your pedalboard, from front to back in inches. Width : 20.00" Width : 19.75" Width : 19.50" Width : 19.25" Width : 19.00" Width : 18.75" Width : 18.50" Width : 18.25" Width : 18.00" Width : 17.75" Width : 17.50" Width : 17.25" Width : 17.00" Width : 16.75" Width : 16.50" Width : 16.25"
Please select the style of your pedalboard... flat, angled, plank, etc. 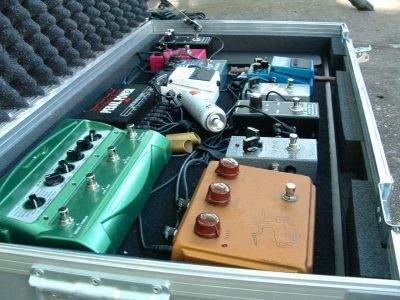 Please select the type of surface for the top of your pedalboard. Please select one of the paid methods. A one-time price of $105.00 will be added to your order. The length and width define the overall size of your pedalboard specified in inches. Our pedalboards have a protective molding around it’s perimeter. This molding occupies a small amount of the pedal board edges however you can typically place pedals very close to the edge by overlapping the molding a little bit with the pedal. 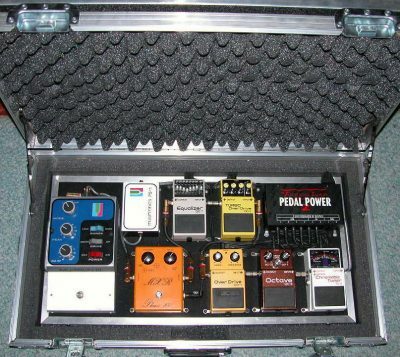 Keep in mind if you have items that extend past the pedal board edges, your case will need to be made to compensate for the overhang. Flat, low profile, at home on the floor. Flat, low profile, on stage at “The Tonight Show”. Flat, Plank: (not shown) This is similar in appearance to the “Low Profile” version in that the pedalboard is flat (not angled) and is used in three basic ways… (1) An alternate design for when you need a very stiff “plank” to span your pedalboard across a keyboard stand or similar situation. (2) We may use a Plank style when we are building an elaborate multi-level pedal board. (3) If you will be screwing all your effects to the pedal board, the “Plank” (and the “Angled” version as well) use a thicker plywood material that will take screws better. Angled: We add a rise to the back of the pedalboard to create an angle on the pedalboard surface. We use similar materials to the “Plank” that are more stiff to support the span of the angle and also works well if you are screwing pedals to the pedalboard. Velcro Loop: Features a premium grade Hook and Loop fastening system. (1) Heavy-duty nylon Loop fabric is laminated to the pedalboard panel and covers the top surface. (2) A supply of 1″wide, high bonding, Pressure Sensitive Adhesive (PSA) backed hook strip material is included. This attaches securely to the bottoms of your pedals, tuner, power supply, etc. Just cut to length and apply by following easy instructions. Our tests have shown this high tech adhesive to have excellent bonding strength to a wide variety of surfaces and withstand adverse conditions. (3) A supply of 1/2″ wide plain hook strip material, to be cut to length and used to retain cables, power cords, etc. 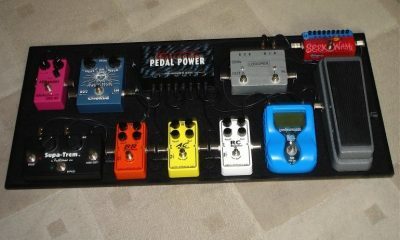 to the pedalboard is also supplied. ABS Hardtop: (not shown) The top surface does not have Velcro. Instead it has an ABS overlay that is laminated to the pedalboard substrate. Use this if you will be adding your own strips of self-gripping fasteners to the pedalboard surface or if you will be screwing your pedals down to the board and don’t need Velcro. A Great Pedalboard System that simply works — built any size you need. 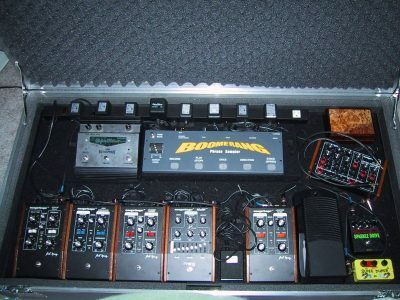 Stompin-Ground.com offers both Hook and Loop (Velcro-type) and Hard-Top pedalboards for your pedal effects and fitted touring cases for transport. 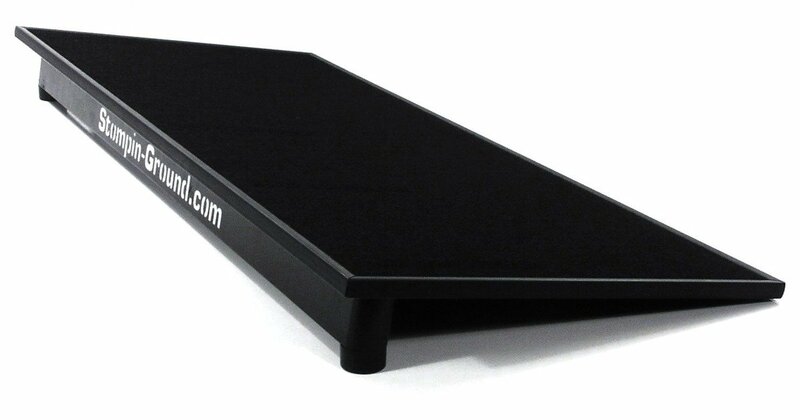 Stompin-Ground Pedalboards are the best method available to create and secure your pedal layout for rock solid performance. Reduces wear on your pedals and cables yet changes are easy as can be. Stompin-Ground pedalboard systems are designed with the touring professional in mind. We have many years of time tested quality built into every one we make. Evolutionary products and solutions that simply work! Stompin-Ground Products are used professionally around the world and endure many touring situation. 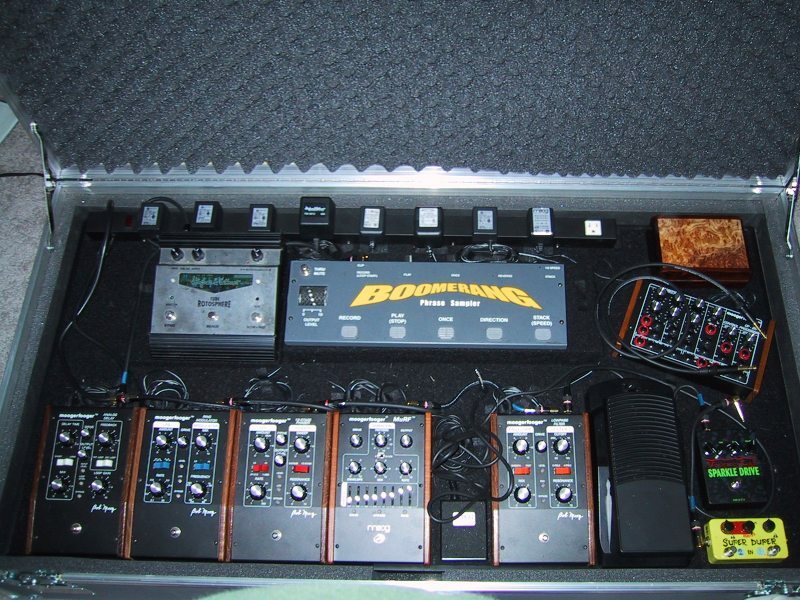 Our Pedalboards and cases are design to keep the show on the road and make your stage setup a snap. 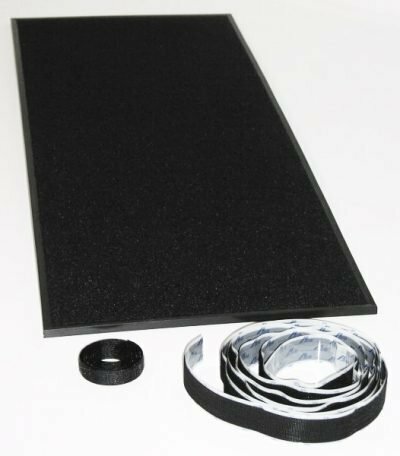 • Heavy-duty nylon Loop fabric is laminated to the pedalboard panel and covers the top surface. • A supply of 1″wide, high bonding, Pressure Sensitive Adhesive (PSA) backed hook strip material is included. This attaches securely to the bottoms of your pedals, tuner, power supply, etc. Just cut to length and apply by following easy instructions. Our tests have shown this high tech adhesive to have excellent bonding strength to a wide variety of surfaces and withstand adverse conditions. • A supply of 1/2″ wide plain hook strip material, to be cut to length and used to retain cables, power cords, etc. to the pedalboard is also supplied. “Gripping Grid” Footprint: The bottom of the flat low profile pedalboard has multiple low-skid, non-marring urethane rubber feet arranged every 4″ to 5″ in a grid pattern to insure excellent contact with the stage. Pedalboard Panel: Made from a 1/4″ commercial grade Masonite type panel which has an extremely hard 4 layer urethane and alkyd finish. 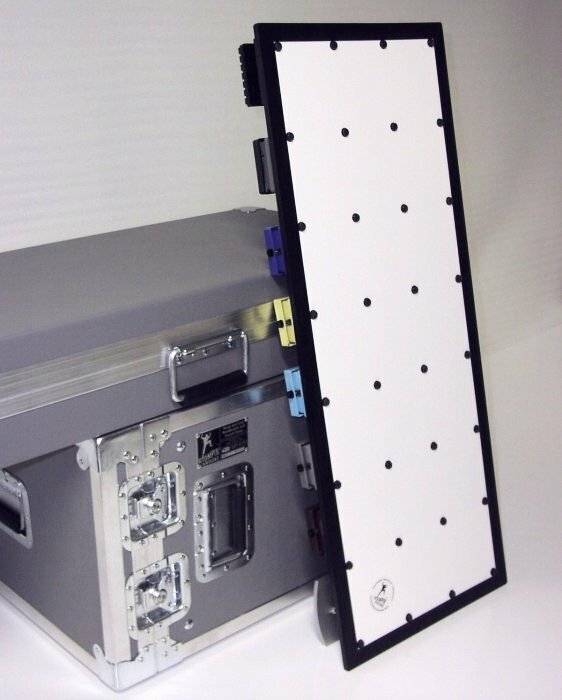 The very low profile of the pedalboard panel and the Gripping Grid footprint enable it to grip to the floor even if the floor is not perfectly flat. Extruded Edge Molding: Made of high impact, virtually unbreakable, R-PVC that protects and finishes the edge of the pedalboard. Unlike aluminum, this basically eliminates sharp burrs that can occur over time due to the edges getting bumped around on the road which may cut fingers. 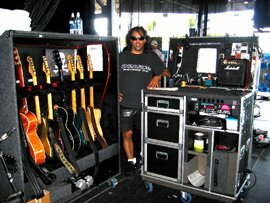 Guitar Tech Superhero… Saving the show at an arena near you! Jerry’s clients include Ritchie Blackmore, Steve Morse, Michael Schenker, John Oates & Jeff Catania (Hall & Oates), Leslie West (Mountain), Vinnie Moore, Alice Cooper, Ritchie Scarlet and many more. I started with the base of 48"x 20" and added some custom changes and a second level. I sent in drawings and spoke with them on the phone several times. They had excellent suggestions and helped me to get it perfect. The case will be shipped out soon, and I will be putting the project together very soon! These dudes are awesome!!!! Been dealing with them for years, even back when they were about the only ones making anything to do with pedalboards. You want the best? Go with the guys that pioneered it!